Durable and light upgrade set for manual sniper rifles. 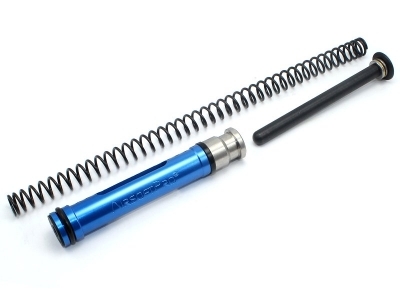 Package contain light 2015 hybrid piston , tempered spring and steel, 9mm steel spring guide with the bearing. Hybird Piston made of 3 kinds metal. Aluminium piston light body provides a great reduction for the weight, POM (polyacetal) ring in the middle provides minimum friction against the cylinder, and the Stainless steel rear part ensures excellent wear protection against the sear. Inner diameter is 13,3mm so you can use strong springs from our offer. This new piston 2015 generation has two holes in the body. This save 4grams of the piston weight. Spring guide is made of two screwed parts with the thrust bearing in the middle. 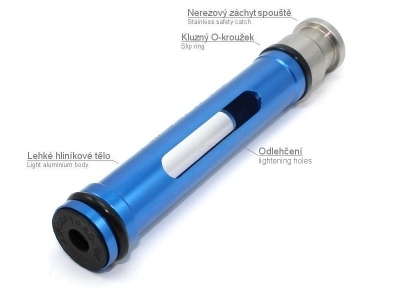 The outer diameter is 9 mm and it is designed only for the upgrade springs. 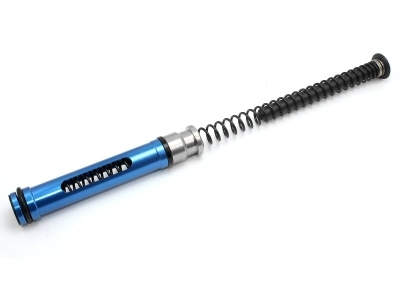 Based on our experiences M150 spring can reach 550FPS (165 m/s). Piston is not suitable for Marui VSR / BAR 10 or Marui L96 rifles! Package include piston, spring and spring guide.